The Spring 2006 Knitty is out! It’s right there, in black and white and lovely color. My magic toe-up cast-on. I haven’t seen my name in print since about 6th grade. To say that I’m excited by this would be a gross understatement! Oh, yeah… the rest of this issue of Knitty looks pretty decent, too. And the cast-on is now linked to via the Freebies page. Sharp-eyed readers will note that there are two items crossed off the things to do list! I don’t recall ever finishing two things in one day before. It was a very good day! 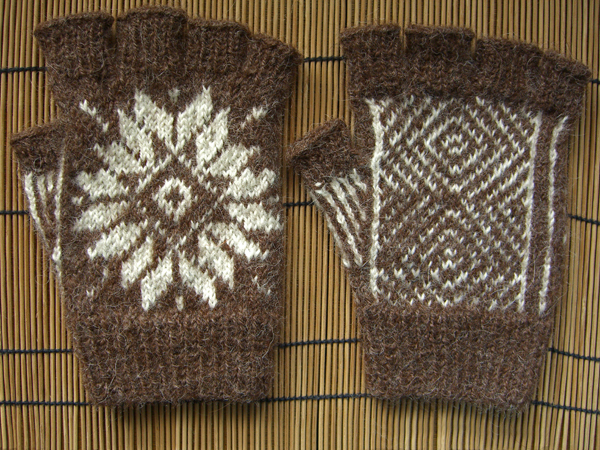 First up are the replacement Fair Isle fingerless gloves for #1 Son. I finished the last finger in the morning and then wove the ends in while waiting for my oil to be changed. There was another woman in the waiting area also knitting. I think she was working on a pair of socks, but since she was very heads-down with her pattern I didn’t want to intrude. I just love these socks. The finished product is so soft and cushy. And I love the cables and the heel and the toe and the bind-off. It’s one of those finished objects that I look at and have a hard time believing that it actually came off my needles. If my sock pal doesn’t like them, I will take them back in a heartbeat! The particulars about both projects can be found on their own permanent project pages. You can get there via the link in the right side-bar, the FO-2006 gallery, or by clicking on the links in this post.